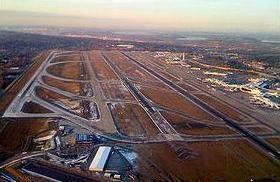 October 29, 2010 - The Federal Aviation Administration (FAA) announced the award of its largest Voluntary Airport Low Emission (VALE) grant for an $18.3 million project at Seattle-Tacoma International Airport (Sea-Tac) to improve air quality and to reduce the use of conventional fuels at the airport. With the VALE grant, Sea-Tac will be able to install a centralized preconditioned air plant that will allow aircraft arriving at the gates to shut off their auxiliary power units and connect to a cleaner central heating and cooling system. This project will greatly reduce aircraft emissions on the ground. ?This program is helping airports around the country make needed technological investments so they can be more environmentally friendly,? said U.S. Transportation Secretary Ray LaHood. Since the first VALE grant award in 2005, the FAA has funded 40 projects totaling $83 million dollars. FAA Administrator Randy Babbitt announced the grant during a press conference in Seattle where he highlighted environmental efforts under way at Sea-Tac and by the Alaska Air Group (AAG) as examples of the kind of innovative work being done in the aviation community. ?The FAA is encouraging airlines and airports to find creative ways to reduce aviation?s impact on the environment,? said Administrator Babbitt. ?NextGen technology will also help aviation go even greener by significantly reducing the amount of fuel burned during air travel.? Administrator Babbitt discussed an innovative program under way in the Sea-Tac area known as the Greener Skies over Seattle project. The project began in early 2009 with the Alaska Air Group (AAG), which includes Alaska Airlines and Horizon Airlines, the Port of Seattle and the Boeing Co. The AAG is seeking to improve efficiency at Sea-Tac through expanded use of NextGen satellite-based technologies to provide more direct and optimized descent paths to landing. The program has the potential to provide environmental benefits to the region through reducing fuel burn, emissions, and the number of people impacted by aircraft noise. In addition, lessons and benefits gained from this effort may be transferred to other airports around the nation. In mid-2010 Greener Skies over Seattle became a FAA project and the first phase of Performance Based Navigation instrument flight procedure development is now under way. Seattle?Tacoma International Airport also known as "Sea-Tac Airport" or Sea-Tac is located in SeaTac, Washington. It serves Seattle and Tacoma, Washington as well as the rest of western Washington. The airport is the primary hub for Alaska Airlines, whose headquarters is located near the airport, and its regional subsidiary Horizon Air. The airport has service to destinations throughout North America, Europe and East Asia. "Welcome to Sea-Tac!" says the automated announcement in the airport's parking garage and skyways, using the nickname that residents of the Seattle metropolitan area have given it. The nickname arose before the city of SeaTac, Washington was founded. In 2009 Sea-Tac served nearly 31.3 million passengers, making it the 18th busiest airport in the United States. It ranks 25th in total aircraft operations and 19th in total cargo volume. The top five carriers at Sea-Tac in 2009 were Alaska Airlines (34.2%), Horizon Air (13.8%), Southwest Airlines (8.9%), United Airlines (7.0%), and Northwest Airlines (6.4%).